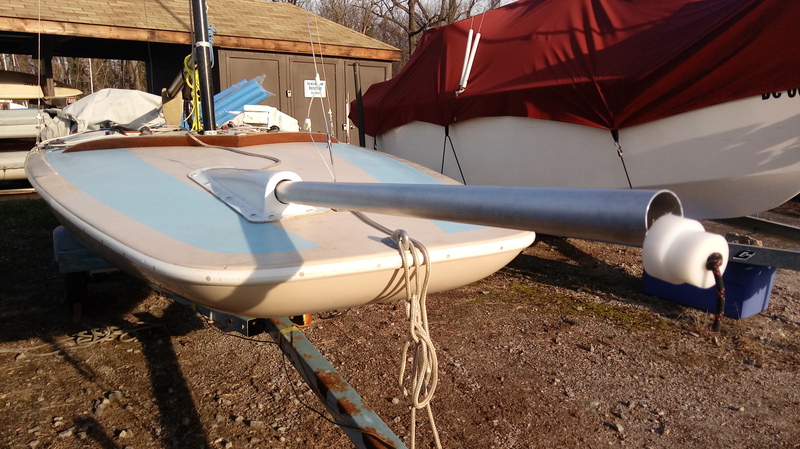 The chill of winter is slowly giving way to signs of spring and with it a renewed sense of urgency to get “626” shipshape for the sailing season. Purchased as an M20 built by Johnson in 1983, we’ve been working in fits and starts to convert it over to an I20. 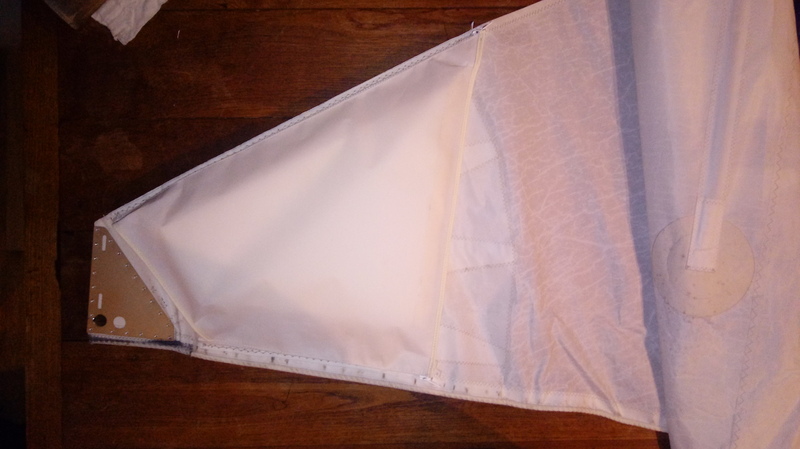 This involves the addition of a retractable sprit to fly an asymmetric spinnaker. Sounds simple, but the mechanics and DIY use of parts extend beyond both my physical capabilities and mental capacity (fortunately we’ve got a wise[ned] and patient Scow guru by the name of Stew to guide us). 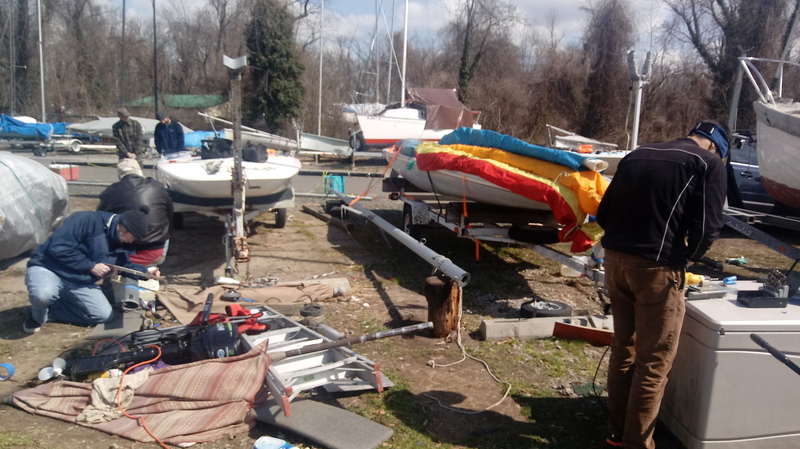 Still a bunch of bits and pieces to finish off here and there (e.g., take-up reel for halyard, retraction line, affixing jib downhaul), but the main structures like the hood and pole are in place. Two weekends ago we gathered three of our scows in an assembly line. The task – to convert our mast placements from a keelson step to a deck step. 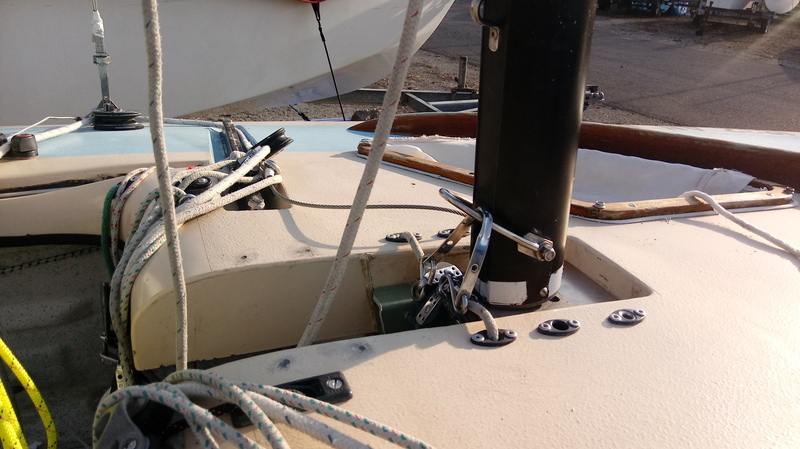 Sawing down your mast is not for the faint of heart, but the longer term logic is that if a shroud or stay breaks, then the mast can readily fall over with minimal impact. The alternative could be a nasty crimp and bend in the mast or stress on the fiberglass mast well. Hopefully, things won’t go in that direction, but it’s better to be prepared. Given that I only purchased 626 a few months ago there is a much longer list of maintenance to be done, including: naming her (626 is the racing number that came on the sails), revarnishing the splash rail and spinnaker well, bracing the tiller handles with through bolts, redoing the bunks on the trailer, and whatever else I want to trick out my ride. Hopefully, my next post will involve a lot more water and sails. Previous Post2018 Cherry Blossom Regatta: April 21-22Next PostRookie Regatta a Big Hit! Way to go Stas! Love the detail on your story. That is a pretty boat!